The name “garnet” originates from the medieval Latin granatus, meaning “pomegranate,” in reference to the similarity of the red color. Garnets have been used since the Bronze Age as gemstones and abrasives. Necklaces studded with red garnets adorned the pharaohs of ancient Egypt. Signet rings in ancient Rome featured garnet intaglios that were used to stamp the wax that secured important documents. The clergy and nobility of the Middle Ages had a preference for red garnets. Garnet is actually a group of several minerals. Five of these – pyrope, almandine, spessartine, grossular and andradite – are important as gems. Pyrope and almandine range from purple to red. Spessartine is found in exciting oranges and yellows, while andradite is mostly yellow to green (the gem variety demantoid). Grossular may have the widest range, from colorless through yellow to reddish orange and orangy red, as well as a strong vibrant green called tsavorite. The Smithsonian’s antique pyrope hair comb is one of the most famous pieces of garnet jewelry (pyrope is from the Greek pyrōpos, which means “fiery-eyed”). A large rose-cut garnet sits at the crest, much like a queen serenely surveying her court. 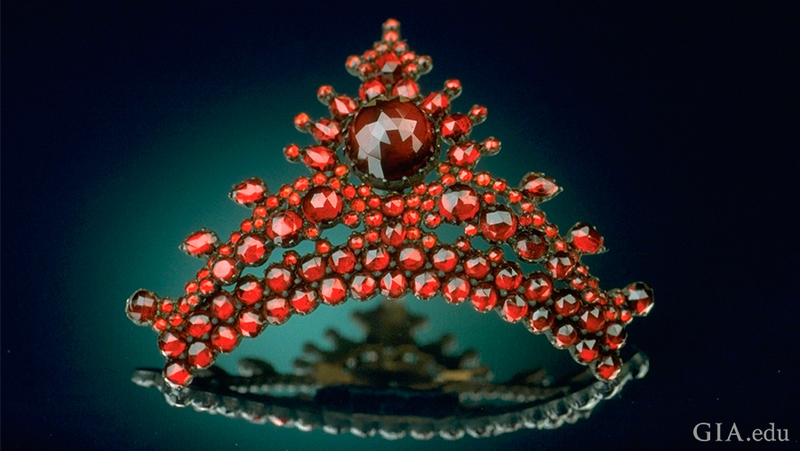 The pyrope garnets that decorate this tiara-like jewel came from the historic mines in Bohemia (now part of the Czech Republic), and these rich red beauties were extremely popular during the Victorian era (1837–1901), when this piece was fashioned. Curious about your garnet birthstone’s reputed health benefits? According to Indian astrology, garnet helps eliminate negative feelings (depression, guilt) and instill greater self-confidence and mental clarity to promote creative thinking and peace of mind. In ancient and medieval times, gems like garnet were also thought to be remedies for inflammatory diseases and to soothe the angry heart. Garnets come from many different regions and countries. Bohemia was the primary source of the red pyrope garnets so popular during Victorian times. In 19th century Russia, green demantoid garnets from the Ural Mountains were prized by the Russian royal family and used by the great jeweler Peter Carl Fabergé (1846–1920). Today, the African continent supplies much of the world’s garnet. Namibia is now producing demantoids, and most of the bright green tsavorites in the market come from Kenya, Tanzania and Madagascar. Namibia and Tanzania are also key sources of the rich orange-to-yellow spessartine garnets. For many years, Southern California’s Little Three mining area was known for producing this spellbinding gem, The birthstone for January is also found in Myanmar, Brazil, Iran, Afghanistan, Pakistan, India and Sri Lanka, among other countries. The different types of garnet range between 6.5 and 7.5 on the Mohs scale of hardness. 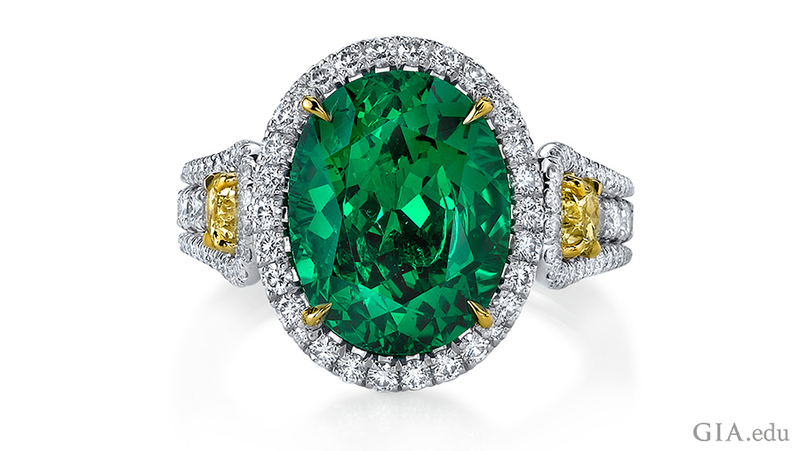 This means that this birthstone is more susceptible to damage than rubies, sapphires and diamonds. So while not all garnets are good candidates for daily wear, they are ideal for earrings, brooches and pendants. Give thought to how you store your garnet jewelry. If you let it rub against harder gems – again, think diamonds, rubies and sapphires – it can be scratched. And in turn garnet can scratch softer gems, such as opals or pearls.